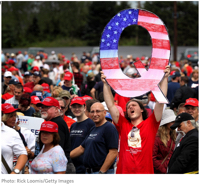 QAnon started as a cryptic post on 4Chan, an internet message board, and blossomed into a sprawling alternative theory of everything. Historical perspective: This right-wing conspiracy theory began with an October 2017 post on the 4Chan and 8Chan imageboards under the name "Q" who followers believe is a high-ranking government official. According to Q, Mr. Trump is on the verge of exposing a cabal of pedophiles, globalists, and celebrities who secretly control America.